When it comes to iconic, readily-recognizable designs in the watch world, Rolex is certainly a brand that would be on the tip of most peoples’ tongues. This is evidenced by our own coverage here, as we have looked at quite a variety of watches that pay homage to the Crown. While there are certainly no end to the cheap (and cheaply built) in that arena, there are plenty of options (still affordable) for those looking for quality in their build. Today, we’re having a look at another in that end of the spectrum, the Davosa Professional GMT. 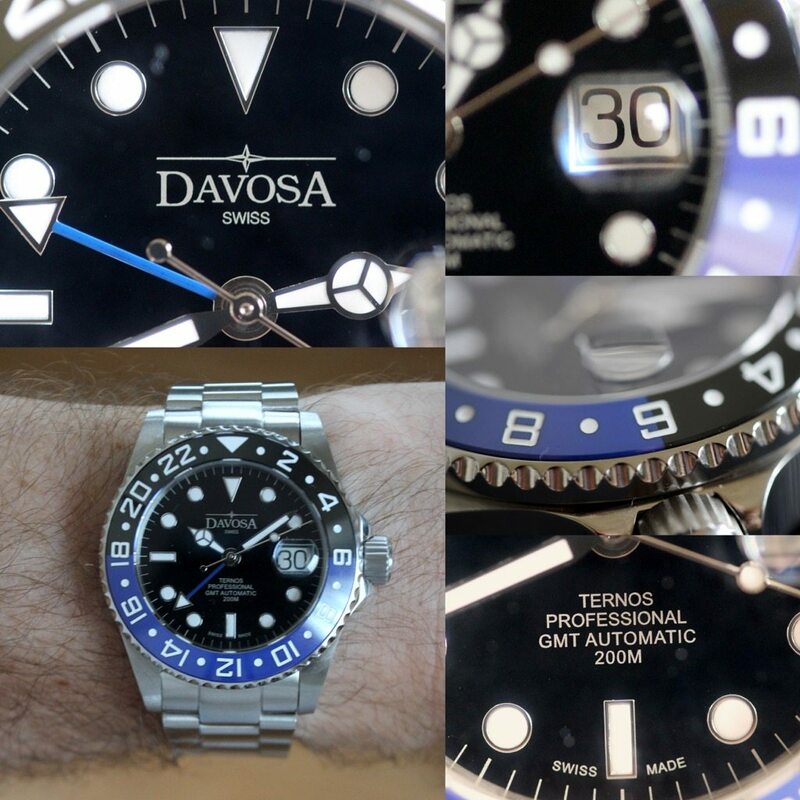 When we started talking with Davosa, I quickly homed in on the Davosa Professional GMT, due to it being based on the Rolex GMT Master II (aka, the “Batman”) with it’s blue and black ceramic bezel. So, in the plus column right off the bat you had my favorite complication (GMT), a color scheme I already dug (blue is my favorite color), and a nickname that gets my attention. Add to this that I wanted some more time to tell if the “Mercedes” handset that is typical to Rolex was something I’d like longer term, and it was all but a foregone conclusion that I’d want get this one on in. Fortunately, Davosa had one that could loan out. Now, I will say at the outset, I have not seen – or handled – a Rolex GMT Master II in person. So, I cannot give you a true comparison between that watch and the Davosa Professional GMT. On it’s own, however, I feel the Davosa implementation is a rather nice watch. For instance, let’s start with that blue-black bezel. For a brand that would want to cut their costs, they might opt for an aluminum insert, or even a two-tone plastic (to try and mimic the ceramic look). That’s not what Davosa did, however. They went the ceramic route, which certainly makes for a lovely look and feel. Or, what about the movement? Again, in the world of homages, this could be a place to go with some knockoff. No, again, Davosa is keeping it Swiss, with their movement which is labelled as a DAV2893. Which could make you think that it’s either an actual ETA2893, or based off of that movement. made by some unknown. Well, we asked the brand straight up, and the word is that it’s an actual 2893. Rounding out the rest of the “hard specs” you’ve got the sapphire crystal (with cyclops magnifier, which I am a fan of) and stainless steel making up the 42mm case and bracelet. So, yeah – the Davosa Professional GMT has the materials and guts to call itself a quality watch. Which is good, because when things are being measured against what is coming from Rolex, that’s a high bar in terms of quality and reliability to be measured against. On the dial side, again, things very much have that familiar look and feel. Yes, you have the clear and bold Davosa logo up top (which is a good thing as it’s clearly not a fake), and down on the bottom you’ve got the four lines of text which carries, again, the look of the more famous watch. While things are by and large brushed finish on the watch, there are some polished surfaces (side of the case, knurling on the uni-directional bezel), which gives you the glints of light that I also find welcome. So, the Davosa Professional GMT has the looks (it even caught the eye of one my friends who has a Rolex of his own), which leaves us with the question of how the real-world performance is. In a word, simple. It’s simple to size, simple to wear, and with the full metal jacket it’s got, it just about ready for whatever you want to throw at it – the office, weekends, and even with a suit. Now, on the suit front, there is no disguising that the 15.5mm height of the Davosa Professional GMT is not what one would consider slender. With the right cuffs (say, French) though that can be made less of an issue. I wore the Davosa Professional GMT in a variety of situations over a few weeks, and it worked well for me. As I spent time with the watch, I realized where my own personal tastes began to diverge from what the watch is. While there is a lot to like about the Davosa Professional GMT, there are some things that, for me, were less of a good thing. In the objective side, the crown is simply too large. In practical terms, that means you’ve got a better chance of it digging into your wrist. From a design perspective, it just feels off-balance (I suppose that more subjective) in terms of the overall proportions. That leaves us with the truly subjective, and gets more into the question we summarize things with – would this be a watch that I would wear? Well, sure, I would not mind having this to break out now and again. In terms of regular, daily wear though? The first thing going against it (again, this is solely in my book, and not a knock on the watch) is the thickness. I have come to appreciate thinner, lighter watches that are less of a presence on my wrist. The other demerit for me was the handset. I know it’s a classic, and many folks like it. For me, it just feels undersized. Which, if you look closely at the handset, they’re really not. However, the eye focuses first on the lumed parts, which when you just see that, makes it feel small, at least for me. Would I wear it? On occasion, sure. What I’d change: That crown could stand to stick out less (say, half as much). Previous articleHourTime Podcast: Casio Worldtimers, Bitcoin, Carl F. Bucherer, and Orsto! X-Wind. Even though it is well made and and smoothed out on case and bracelet, it has a tendency to feel a bit uncomfortable on the wrist for long periods of time. When I wind the stem, it feels toyish (the winding has no resistance). Yet with all of this the watch has some great materials and screams quality all around. The ceramic bezel looks amazing. The sapphire crystal picks up a lot of the blue from the bezel and the GMT hand and reflects it across the glass; beautiful. It dresses down and up really nice. I have mixed feelings about this piece but I feel that it’s a keeper and not a complete homage because it is much larger and thicker than the original at a fraction of the cost. Great review!! I have the Ternos Professional TT and I love it. The fit and finish of the watch is really, really good. It looks better than my Omega Seamaster.